Recent surveys show that 87% of business executives place reputation risks ahead of all the other threats they watch closely. That’s why they include online reputation management measures into their marketing strategy. Let’s take a look at what a brand can do to improve its online presence and reputation among its customers. When people google your brand name, your brand site with a few category pages and a few links to your social pages are what they expect to see first. And the more of the top 10 results lead directly to your site and its categories the better. For example, Mahabis occupies almost all the brand name search results above the fold. If your brand pages are not ‘strong’ enough to own the top, then other sites with relevant results may interfere and push your pages down in SERP. To avoid this situation, make sure that you have proper linking between all your website pages and social accounts like Twitter and Instagram, Facebook Product page, YouTube channel, and others. Interlinking will help Google to identify all those pages as your ‘official’ ones and thus, take them higher in SERP. What to do with those results that you don’t ‘own’? If those are positive (reviews, articles on third-party websites and media, etc. ), do nothing – they add to your positive brand image. Just monitor the negative ones and see what you can do. If it’s an unfair or very subjective review – try to work around with the author to make it more positive. Customers often compare your brand with competitors before purchase. They are looking online for articles and reviews that help them compare your products or services. Mostly they use a combination of your brand keywords including such modifiers as ‘vs.,’ ‘compared to,’ ‘better than,’ etc. You may want to research those keywords and see what results people are getting for these search queries. People often search for brand alternatives that offer more comfort to them. Thus, you may also want to check the competitor’s keywords that contain such modifiers as ‘better,’ ‘cheaper,’ ‘faster,’ ‘easier,’ etc. 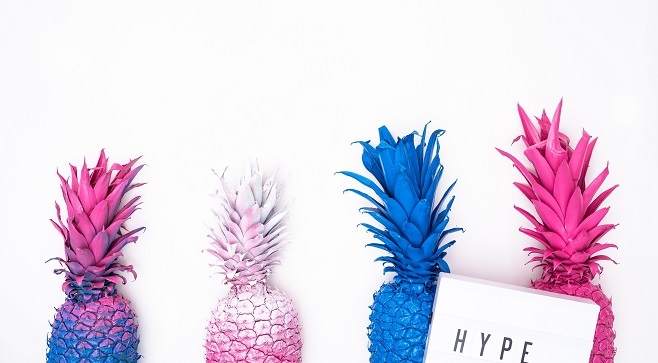 If you manage to create the content for these keywords and show that your brand is a better alternative, it will help you to occupy the top for those search terms. 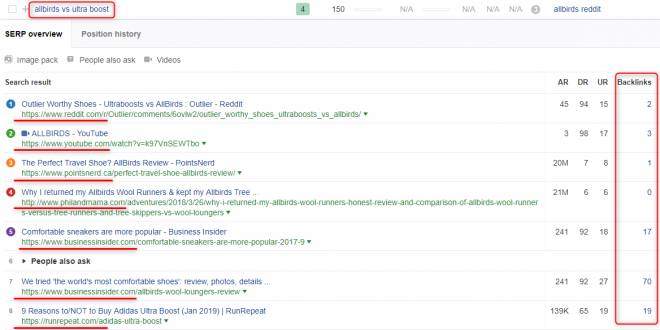 If you take a closer look to SERPs from the example below, you may notice that our example brand Allbirds doesn’t occupy any of the top positions for those search terms. In some cases, the articles that compare two brands offer little to none info about their products. Create your own content that targets those search terms and outrank those articles. In the first case, you should pay attention to the date the article was published. For example, the articles posted a couple of years ago may contain the old photos of the product, outdated info about the features or price. Email to the author and offer to update those photos and info. Don’t hesitate to create a paragraph or two with the new information that you would like to include in the article. With useful content that helps your customers solve their issues you get the targeted traffic to your website. Monitor new search terms that you may target and create the content around those topics before anyone else. This tactic is especially suitable for finding the questions from your customers that they are looking to solve. 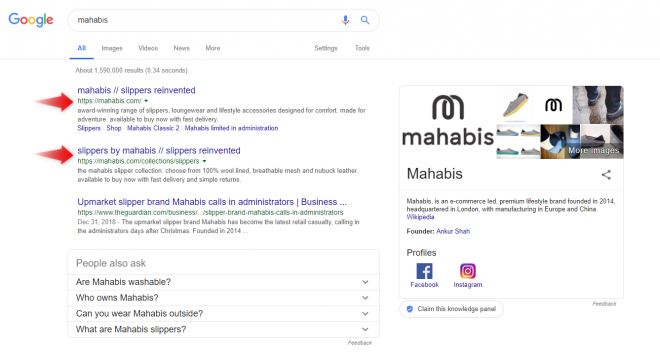 For instance, check the brand ‘mahabis’ for the ‘question’ terms, and select the keywords that could be a perfect base for posts that addresses pain points of their customers. Ranking high for these search queries will ensure you that no issue is left unnoticed and will help reduce customer frustration. If you do a proper optimization and get some backlinks to the articles you create for those terms, you may push others lower in SERP. Backlinks are still considered to be one of the strongest ranking factors, and you can’t neglect the opportunity. Managing your online presence and reputation is an ongoing process that likely never ends (unless you decide to bury your brand). User reviews and articles will keep appearing – both positive and negative. Include constant monitoring of what people are saying about your brand online into your marketing routine. When you monitor the mentions of your brand – it means you can react fast and address all possible issues and handle negative comments in time. The easiest way to monitor your brand mentions is setting up Google Alerts. This free and handy tool helps you get the freshest info of what people are saying about your brand online. You just enter the terms you want to monitor and set up the sources of those mentions. Monitor the rankings of negative reviews and make sure that they don’t rank for your target keywords. Improve your products on the feedback and get back to unsatisfied customers with a better offering. Creating a positive brand presence online is not a matter of one day. You should build and manage your reputation consistently through all the communication channels you have: your website, blog, emails, social media, etc. Make sure that you control everything on your owned sources of information. And keep monitoring what people are saying about your brand on the web. Thus, you will be able to react in time and reduce possible spreading of negative information. Remember that your activity on reputation management isn’t limited to addressing negative reviews and comments. It’s a constant work of establishing your brand as a trustful and user-friendly business. Helen is a content marketer at Ahrefs. She explores new things every day to impress her readers with catchy stories. Apart from all that marketing stuff, Helen loves listening to rock music, reading and traveling.